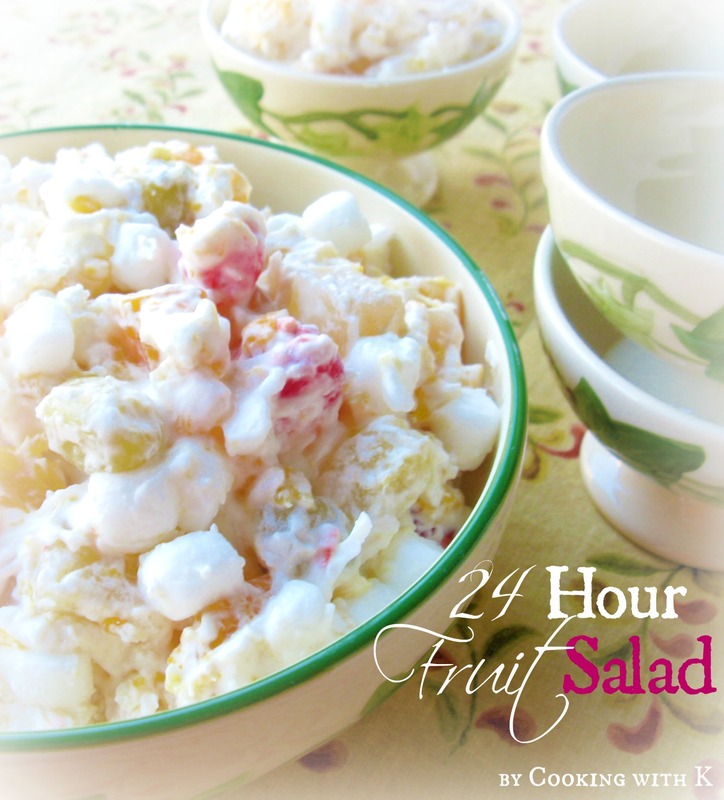 24 Hour Fruit Salad, among some of the most popular traditional Christmas dishes in the south often called Ambrosia. 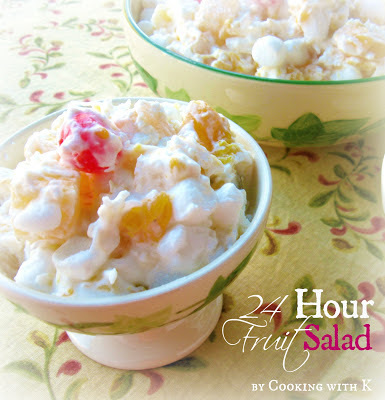 Everyone has their twist on this Classic 24 Hour Fruit Salad. I have seen this recipe made in so many different ways, and with so many different ingredients. In the south, we call it ambrosia. I remember growing up in the 60's, this was my Father's favorite. My Mother served this salad every Thanksgiving and Christmas, and I have carried out the tradition. Like the name says, you make this fruit salad twenty-four hours ahead of serving it. The main little tidbit I can give you is to drain all the fruit really good. I let mine set in a colander for about an hour or so, just to let the fruit dry out a little. This way when you mix it all up, it is not so soupy, and it will stay creamy a lot longer in the refrigerator. That is if you get to keep it in the fridge. This salad is so versatile that people serve it as a salad. or a dessert. In fact, many times this is the way my husbands likes it. The original recipe calls for canned fruit, but you can easily substitute fresh fruit instead, and we do on occasion. 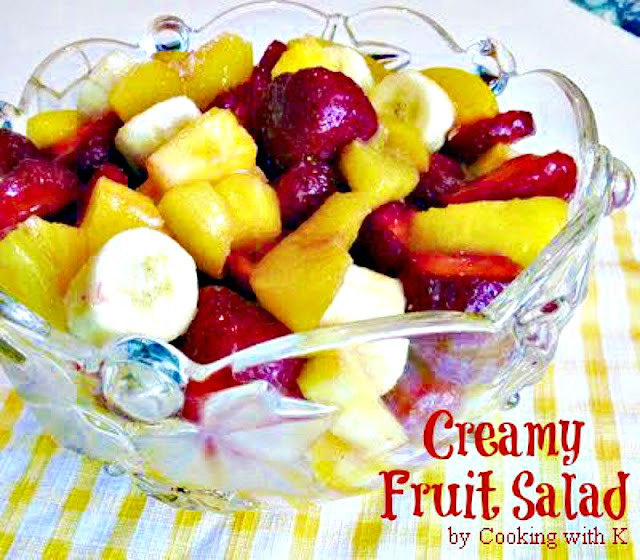 Canned or fresh fruit, you cannot go wrong with this luscious salad. Give it a try, you are going to love it! In a larger bowl, combine the fruit, coconut, and pecans with sour cream. Fold in marshmallow and sweetened whipped cream. Cover and refrigerate 24 hours. Note: You can leave the sour cream off and add more whipped cream. Be sure and drain the fruit really well. I drain mine for an hour before mixing in the whipped cream. You can also reserve the juice from the fruit for a delicious fruit punch later. Yum yum! I love this stuff at Christmas! It's so pretty, too. Oh my! 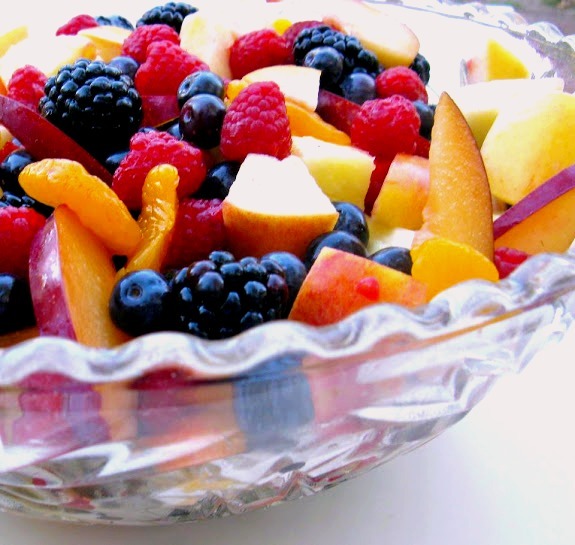 This looks sooo tasty Kay...I love fruit salads. I especially love special recipes that stir fond memories too. My mom would make this every holiday and I swear I could eat the whole bowl!! My mom has a similar recipe but she doesn't add the sweetened whipped cream! This sounds amazing and I'm definitely going to have to try it! Thanks for sharing - pinning to make soon! This look incredible. I have not had ambrosia salad in years. Is sweetened whipped cream like cool whip? Yes or any sweetened desert topping. Dunno if you've ever tried this but add a brick of soffened cream cheese in with the whip cream.., you will love it"
Sounds delicious...thank you for stopping CWK!